This is the announced final post of the “Discovering Russia” series that seeks to compare my experiences with Russia and its culture with other countries I have lived in. Right away, I want to put in a disclaimer at this point: I in no way intend to be judging any of the countries and cultures I am talking about and I don’t claim that what I say is necessarily true. All this is just my personal impression of these countries that have all developed over centuries in their own right. In addition, because I would like to be more objective in my analysis I would like to use data to analyse this question. I guess the role of my personal impressions is thus mainly filling the data with life. The data used comes from the 6-D Model© developed by Geert Hofstede (2010). If we take his data on Russia and compare it with Germany and the UK respectively we get the following graphs. Whereas I feel like I cannot comment that well on two of the dimensions (uncertainty avoidance and long-term orientation), the other aspects describe differences that I think I recognize as described in the comparison that follows. In many ways Russians just talk straight. Two examples of that are the following. First, more often than in Europe, girls on the street might just be addressed by guys that find them attractive. Second, it also occasionally happens that people say how they feel and let everybody know loudly that they are not doing very well. Furthermore, what is fascinating is that contrasts can be found everywhere in Russia and a good example is the way people talk to you: you can feel hurt and alone one moment because somebody shouted at you for standing in the way and minutes later you find yourself in a fun conversation with a caring babushka (grandmother) who wishes you that you find a girl who “holds you tight and never lets you go again”. On that note, wishing everyone well is actually widely spread in Russia: Success, good mood, health and others are all things you wish someone in Russia when saying goodbye and greeting each other. Lastly, friendship is an intimate and deep relationship and it takes a while until you call someone your friend. 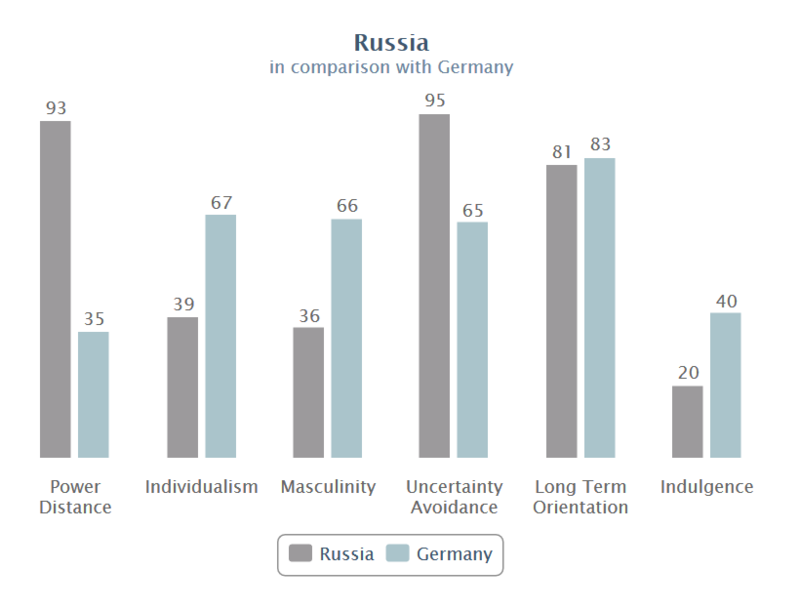 In the data, power distance (acceptance of power inequality) stands out as one of Russia’s most distinct features. According to Hofstede, it can partly be explained with the centralization of power in Moscow and leads to the huge importance of status symbols like foreign cars and western brands. Their importance is quite obvious in Russia: why obvious? Because as soon as you get off the plane in Moscow you get confronted with a high number of expensive “inomarki”, a special word in Russian that stands for foreign cars. First, Germans don’t say and show what they feel like in public as much. This is not as extreme as in the UK where the answer to “how are you” is normally “fine thanks” but still not as open as in Russia where you can see people’s moods even in their face expressions. I think that one reason for this is that Germans are incredibly worried about how they come across and fare against others. The 6-D Model© incorporates this in the seemingly odd masculinity score where masculinity stands for the extent to which a society is driven by competition and wanting to be the best. Another interesting aspect is that regional differences are very pronounced in Germany. There are very strong differences between regions, both in terms of quality of life as well as culture. Another aspect is the different dialects everywhere, although they are becoming less and less important I feel. Russia on the other hand does not seem to have much of a difference in dialects, despite the huge size of the country. A significant difference between Russia and Germany is also that friendship is less strong of a term in Germany. Your friends might well be no more than your local “gossip group”, so a friend is not necessarily your soulmate like here in Russia. This might explain Germany’s higher score in individualism (degree of interdependence in society). In contrast, Russia is a place where friendship and regional bonds with neighbours are very important. Even the language incorporates this: you don’t say “I am going out with my friends” but “we and my friends are going out”. The UK is also very individualistic and heterogeneous in many ways. Especially in London there is not one dominant London culture but many different cultures all mixed together in some way. London is at the most extreme end of the personal freedom scale: everyone is very relaxed and people dress as they wish. Coming across in a certain way isn’t that important as long as you are polite and don’t disturb anyone around you. 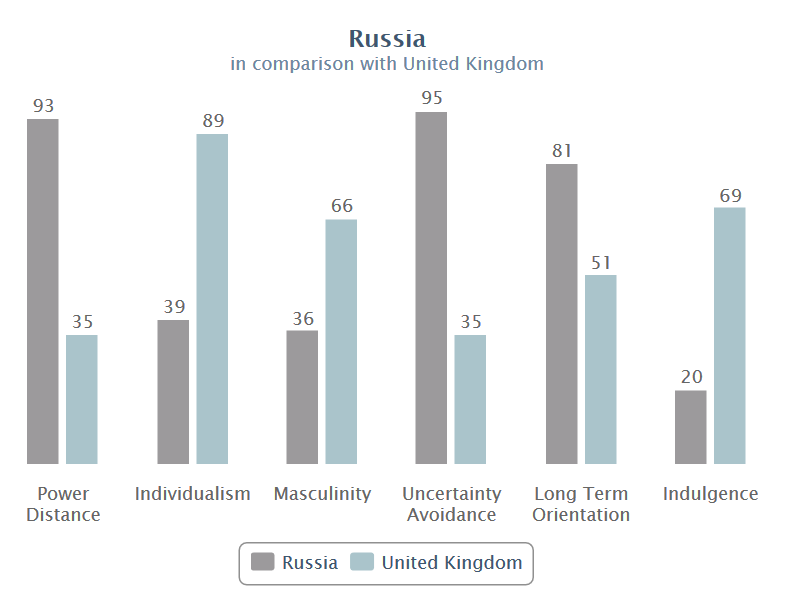 What stands out to me is that indulgence (how well people control their impulses) is way higher in the UK than in Russia and I think I understand what this is talking about. British are known worldwide to be controlled and polite. Scenes like the famous queue on every corner of the city enforce this stereotype. In Russia, I could certainly not observe a queuing culture like that. An interesting habit of Russians in queues is that people just note who they are behind and then come back later to join the queue again at that very place. In summary, this last post of the series offered a very brief comparison between Russia, Germany and the UK. Among the main findings is the difference in power distance that are very obvious on the streets of Moscow. Other differences worth noting are around the model’s masculinity measure, individualism and indulgence. All of these are differences I can back up from my own experience to some extent. With this I would like to conclude the “Discovering Russia” series. I hope that it offers relevant and insightful perspectives. 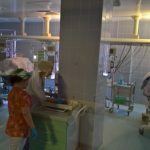 Generally, Russian healthcare doesn’t have the best reputation. However, to every rule there is an exception and so when I was recently given the opportunity to look behind the scenes at a private clinic in Moscow I saw a modern and top nodge clinic where I would happily be treated anytime if need be (although, this seems highly unlikely given that it is a women and children hospital). 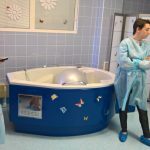 More precisely, the Perinatal Medical Centre (PMC) in Moscow that is the first private maternity hospital and has already delivered more than 30000 babies to date. 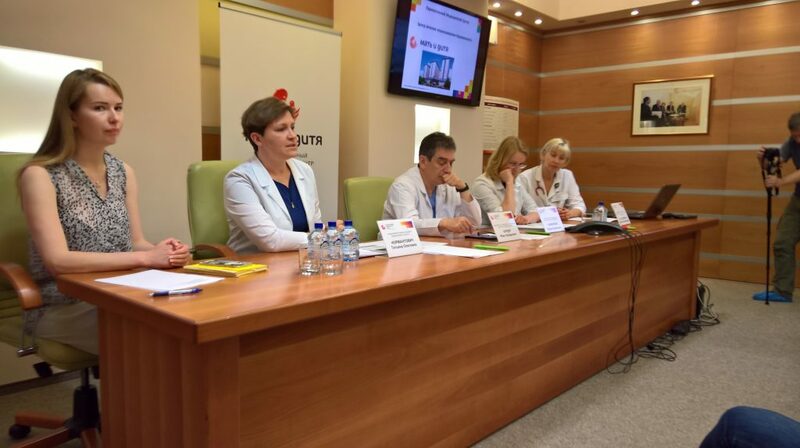 It is part of the MD Medical Group, a listed company that is one of Russia’s success stories and still growing year on year. 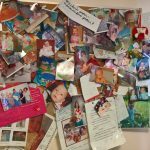 The reason for my visit was an invitation to a press gathering on the occasion of the opening of the new Miscarriage Treatment Centre at the PMC. CEO Kurtser welcomed us with leading members of his team at a short press conference before they showed us the centre and its facilities. 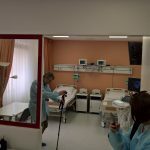 The excursion completely changed my idea about healthcare in Russia and showed that there are western-style medical services available. Hofstede, G., Hofstede G. J., & Minkov, M. (2010). Cultures and organizations: Software of the mind. Revised and Expanded 3rd Edition. New York: McGraw-Hill.